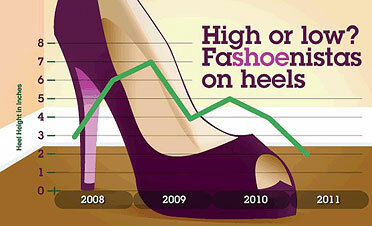 IBM found that the median height discussed peaked at seven inches in 2009 and declined to two inches this year. Five inches gone in two years. But how? According to IBM, the tea leaves of all of this could be read in social media. Now He isn't gonna say go out and start pushing people over in heels under 4" but if you happen to knock into them for wearing kitten heels, then so be it. We need to get back to 7" and we need to do it now!!! I don't know how anyone balances in kitten heels to begin with. But aside from that they make feet look bigger than what they are, especially if they're pointy!